Definitely not very good photographic lighting, and a picture that has required a humungous amount of Photoshop manipulation to salvage an image from a 'soot and whitewash' no-hoper. However, I wanted a picture taken from this spot at Bletchingdon, before the long closed Shipton-on-Cherwell cement works in the background finally succumbs to the bulldozers. 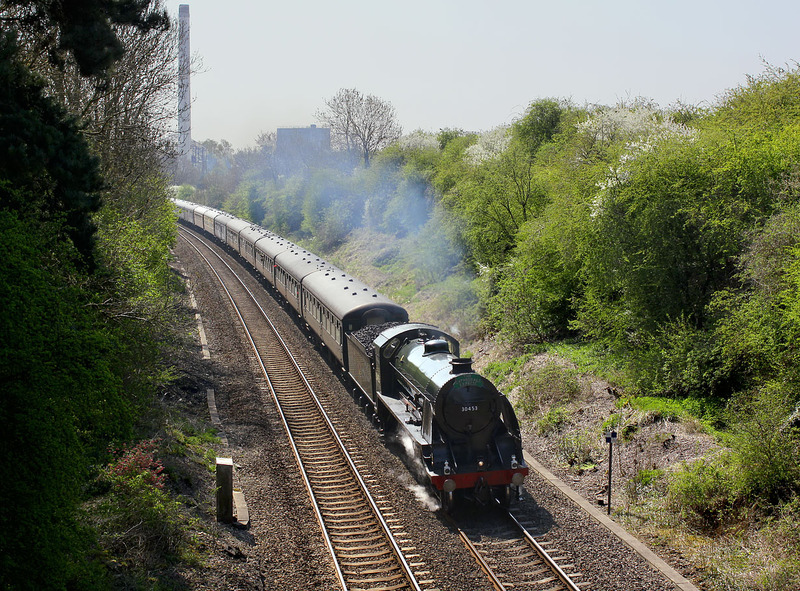 N15 4-6-0 30777 Sir Lamiel (disguised as 30453 King Arthur) heads north with the Steam Dreams 1Z97 08:45 Victoria to Stratford-upon-Avon 'Cathedrals Express' railtour on 23 April 2010.